Suzuki Verona Ignition Coil Replacement at your home or office. Suzuki Verona Ignition Coil Replacement costs $186 on average. What is an ignition coil and how does it work? An ignition coil transforms ignition voltage (12 volts) to the very high voltage pulses (20,000 volts or more) that fire the spark plugs. The number of ignition coils varies depending on car model and year of production. Older cars will have one coil covering all engine cylinders while newer cars may have a coil-on-plug type arrangement — that is every cylinder will have its own dedicated ignition coil. Hard starting or no start. Ignition coils are subject to heat damage and electrical overload, both of which can cause partial or total failure. If the coil is faulty, you may have difficulty starting your car or it may not start at all. Misfiring, loss of power, poor acceleration. Once the car is running, a bad ignition coil can cause poor operation of the engine. Should you have misfiring or loss of power, faulty ignition coils would be among the list of causes a mechanic would investigate. The Check Engine Light will often come on with a trouble code(s) indicating which cylinders are involved. How do mechanics replace the ignition coil? The ignition is checked to assure it is in the “off” position. For single coils that supply all cylinders, the coil is disconnected from either a bracket located in the engine compartment or, in some cases, is removed from within the distributor. The replacement coil is secured and all electrical connections reattached. If the distributor was removed for any reason, the timing is adjusted as required. For individual coil-on-plug applications, the coil is detached from the top of the individual spark plug and replaced. Once the coil is securely in place, all electrical connections are reattached, and timing adjusted as needed, the car is road tested to ensure normal operation. Is it safe to drive with an ignition coil problem? Yes. A malfunctioning ignition coil will cause loss of power and lower fuel efficiency but that will not present an immediate safety issue. If the coil malfunction is causing misfiring, this will allow unburned fuel to enter and permanently damage the catalytic converter from overheating. 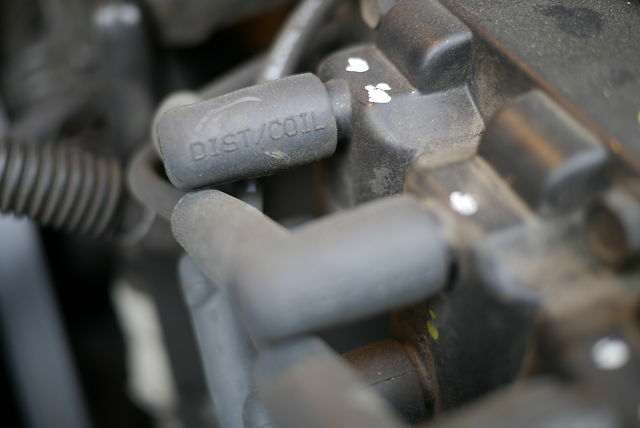 Ignition coil failure can be caused by faulty spark plugs or wires. The mechanic will inspect and may recommend replacement of those components. In a coil-on-plug ignition system, if only one coil fails, you need only replace the faulty coil. Remaining functioning coils can be left in place. In systems with the coil located in the distributor, it may be more cost-effective to replace the entire distributor rather than remove and replace just the coil.